Another of my Mum's classic recpies - I thought it was about time I shared it! I stuff these peppers with a beef and rice mixture, but you could easily substitute the meat for quorn, or a vegetable mix. You could also change the rice for cous cous or quinoa which are equally as tasty! Start off by chopping your peppers length ways, de-seeding, and popping in the microwave for a few minutes to soften. Keep an eye on them, but about 3-5 minutes is usually about right. Put your rice on to cook following usual instructions. While the rice and peppers are cooking fry a diced onion in a pan, and when browned add the mince and combine. When cooked, drain off any excess fat (if necessary) and crumble over a stock cube. Cook for a further few minutes then put to one side. When the mince mixture and rice are both cooked, combine! 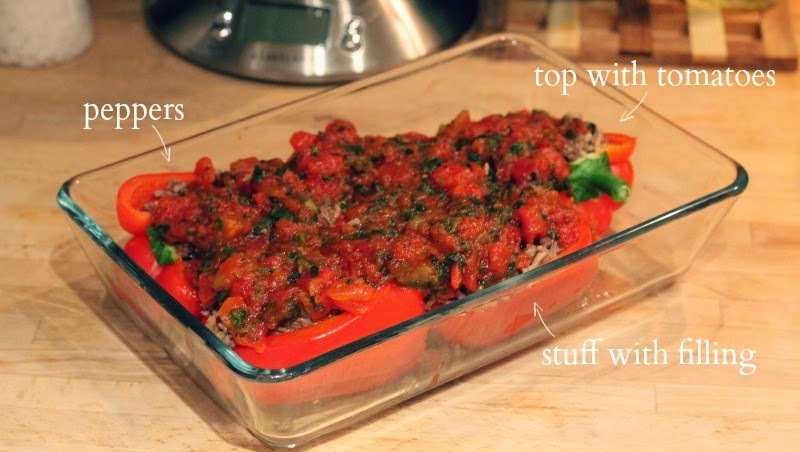 Place your peppers into an ovenproof dish and spoon in the beef and rice mixture - press down with a spoon to fill as much as possible. In a bowl defrost the spinach balls and add to a tin of tomatoes. Pour over the peppers and sprinkle with some grated cheese. Pop in the oven for about 45 minutes - 1 hour on about 180c. Give each person either one or two peppers depending on greed hunger, and serve with steamed green veg. I usually just serve with vegetables, but this usually leaves a not-quite-full boyfriend... hence the homemade wedges this time! You can adjust the amount of rice you use in the stuffing mixture according to taste. 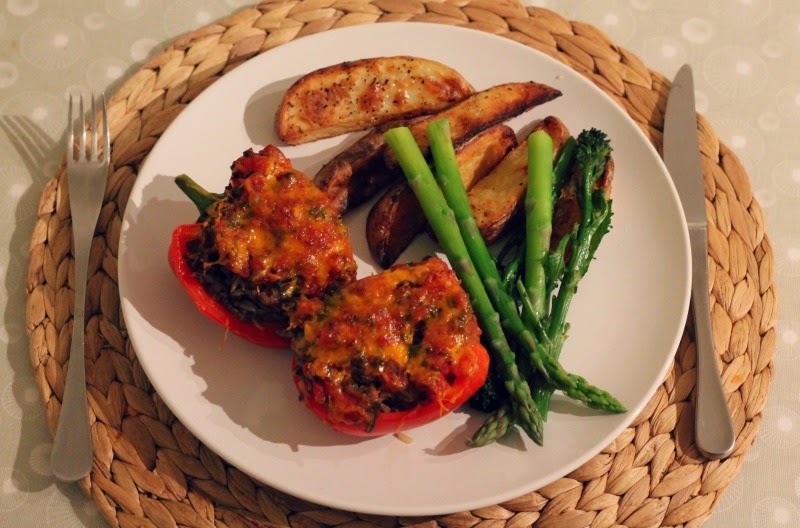 Brilliant recipe and it's given me loads of ideas of how to adapt it too ... thank you! Man alive, these look delicious!